Googleâ€™s new web site â€“ Google Art Project – allows visitors to view over a thousand works of art from some of the great museums of the world. 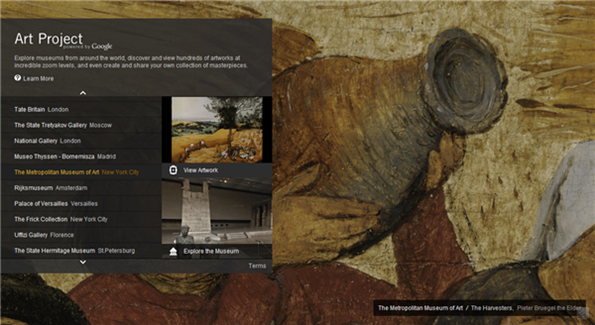 Art lovers can also take a virtual walk through the museums, making the site a sort of street-view for art. In fact the site uses Google Street View technologyÂ to navigate through interactive floor plans to learn more about each museum. For web designers there is tons of inspiration in the form of the great artworks from which we can learn about color palettes and composition. There are 17 museums featured in the project including the Metropolitan Museum of Art and MoMA in New York, the Tate Britain in London, the Uffizi Gallery in Florence and the Van Gogh museum in Amsterdam. Visitors can experience 360 degree views of the interior of the galleries and look at high resolution artworks. Using a custom viewer, you can zoom into paintings, read more about the art, find more work by the artist and watch YouTube videos on the subject. The site is slick and the images are wonderful and include paintings by Botticelli, Van Gogh and Cezanne. The paintings are ultra high definition, you can see every brush stroke, crack and scratch in the oil. 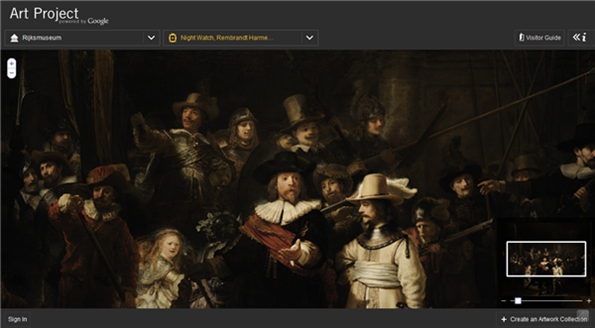 There is a â€œCreate an Artwork Collectionâ€� feature which lets you save views of any of the artworks and build your own collection. One slightly disappointing element is that some of the paintings and features are blurred as requested by the museum for reasons pertaining to copyrights. While visiting a web site may not be quite as good as seeing an artwork â€œin the flesh,â€� the site is very nicely designed, easy to use and offers you to chance to view some of the worldâ€™s great artworks up close without having a backpack slung in your face.